Test-Guide.com is your ultimate source of CDL practice tests in 2019. We have assembled hundreds of sample questions and answers, all straight from the official sources. Use our free CDL practice tests and CDL study guides for the fastest, easiest way to pass your exam! Test-Guide.com's sample CDL questions are a great way to prepare for your CDL permit test. Best yet, our tests require no registration or payment! All of our practice commercial driver’s license tests are categorized based on the actual test outline and are immediately scored at the end of the quiz. Once you are finished with the quiz, you will be presented with a score report which includes a complete explanation and rationale for every question answered incorrectly. We will be adding more sample CDL test questions in the near future, so please come back often. And if you like these practice questions and think they’d be valuable to others preparing for their CDL permit test, please make sure to Facebook! Along with our variety of commercial driver’s license practice tests listed above, we’re happy to share some additional resources for our visitors. Take a look at the options below! Please note: As Test-Guide.com did not create any of the following practice tests, we cannot vouch for their quality. Free CDL Practice Tests – Practice CDL Tests from TruckerCountry.com. Sample CDL DMV Written Tests - From the California Department of Motor Vehicles. All of the information you need to pass your CDL exam will be included in your state's CDL manual, so please make sure to study the latest version for your particular state. State CDL manuals will specify eligibility, requirements, and testing procedures. The manual also acts as a CDL study guide because it covers all of the information that is required to pass your CDL exam. Test-Guide.com maintains a directory of State CDL manuals. You can also find more information about CDL licensing procedures by visiting your state's license agency. Please contact us if you found any of these CDL permit tests useful, or if you have another provider to recommend. If you plan on operating a Commercial Motor Vehicle (CMV) then you are required to obtain a Commercial Driver License (CDL). In order to get a CDL, you must first take and pass a general knowledge test, various endorsement tests (depending on the license type you are seeking) and a driving skills test. The tests that you will take depend on the license classification that you are obtaining (Class A, B, or C) and the type of vehicle that you will be driving (e.g., Tanker, Double/Triple, Passenger Bus). To help our visitors, Test-Guide.com provides an overview of how to get your CDL license. In general, the CDL test is based on national requirements, although each state may add additional restrictions. CDL license requirements focus on your driving record, age, and health. For more information, you can visit our CDL license requirements page. Any single vehicle with a gross vehicle weight rating (GVWR) of 26,001 pounds or more. Combination vehicles that have a gross combination weight rating (GCWR) of 26,001 or more pounds, if the GVWR of the trailer or towed unit is more than 10,000 pounds. Vehicles designed to transport 16 or more passengers (including the driver). Any vehicle which requires hazmat placards or is carrying material listed as a toxin or select agent in 42 CFR Part 73. 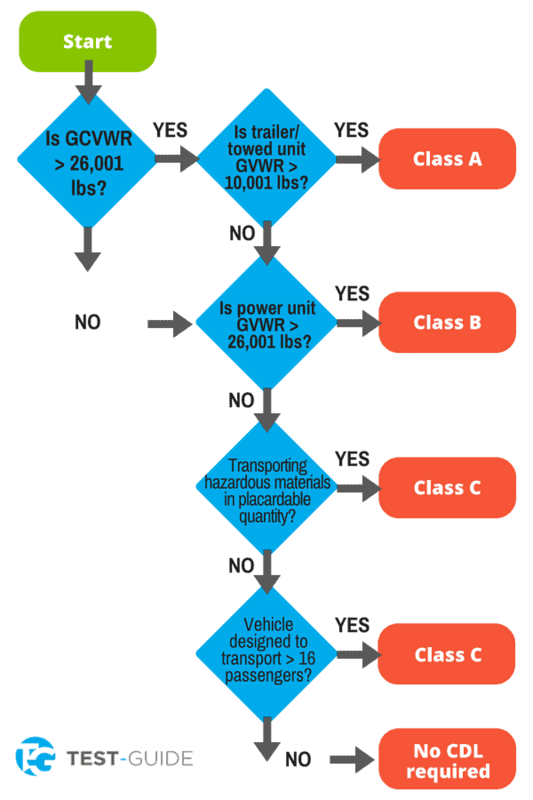 Note: A bus may be either Class A, B, or C depending on whether the GVWR is over 26,001 pounds or is a combination vehicle. General Knowledge – The general knowledge CDL test is taken by all applicants. The test has 50 multiple choice questions. Major topics of the general knowledge test include: CDL rules and requirements, safe driving, safe transportation of cargo, and pre-trip vehicle inspections. Combination Vehicles – If you want to drive combination vehicles you must take and pass this CDL test section. The combination vehicles test has 20 multiple choice questions. The topics on the combination vehicles test include: driving combination vehicles safely, combination vehicle air brakes, antilock brake systems, coupling and uncoupling, and inspecting a combination vehicle. Air Brakes – If you plan on driving a truck or bus with air brakes, or pull a trailer with air brakes, you will need to take the air brakes CDL test. The air brakes test will have 25 multiple choice questions. Topics on the air brake test include: parts of an air brake system, dual air brakes, inspecting air brake systems, and using air brakes. Tank Endorsement – You are required to have a tank endorsement if you plan on driving a CMW over 26,000 pounds that is used to transport liquid/gaseous materials. The materials do not have to be hazardous. This endorsement is only required if the vehicle is a Class A or B vehicle with a permanently mounted take greater than 119 gallons or a portable greater than 1,000 gallons. Double and Triple Trailer Endorsement – If you plan on pulling double or triple trailers, you are required to pass this endorsement test. There are 20 multiple choice questions that assess your knowledge about driving safely with double and triple trailers. This part of the CDL test includes questions on how to couple and uncouple trailers, pulling double/triple trailers, doubles/triples air brake checks, and inspections. Hazardous Materials Endorsement – Hazardous materials (Hazmat) include explosives, flammable and combustible liquids and any materials that the shipper deems as hazardous. You must obtain a HAZMAT endorsement to operate any size vehicle that requires a HAZMAT placard (as further specified in 49 CFR 383.5). This endorsement test has 30 multiple choice questions covering the following topics: intent of the regulations, communication rules, loading and unloading, bulk packaging marking, driving and parking rules, and emergencies. School Bus Endorsement – Although these regulations may vary from state to state, you are required to have a school bus endorsement if you plan on driving a vehicle that carries 16 or more people, including the driver, that is marked with or displays the words “school bus.” A school bus is used to transport students to or from school or authorized school activities. If the school bus is not transporting students, then a school bus manufacturer, dealer or mechanic is not required to have the endorsement. Before receiving a school bus endorsement, you must qualify for a passenger endorsement. This CDL test will cover the following topics: danger zones, use of mirrors, loading and unloading, emergency exit and evacuation, railroad-highway crossings, student management, antilock braking systems, and special safety considerations. Passenger Endorsement – You will need to obtain a passenger endorsement if you plan on driving any vehicle designed to carry 16 or more persons, including the driver. If the vehicle is a school bus, you will need to obtain an additional school bus endorsement. The passenger transport endorsement CDL test will have 20 multiple choice questions on the following topics: vehicle inspection, loading and trip start, on the road, after-trip vehicle inspection, prohibited practices, and use of brake-door interlocks. The sample CDL practice exam questions that we have included above will help you understand which areas you need to work on and let you find ways to improve. So be sure to study your state's CDL manual, take our free CDL practice tests, and review the areas that need a boost. Good Luck! And If you have any other sources for free CDL practice tests, or CDL study guides, please let us know by contacting us and we can include them above.